There’s no shortage of knife sharpeners. 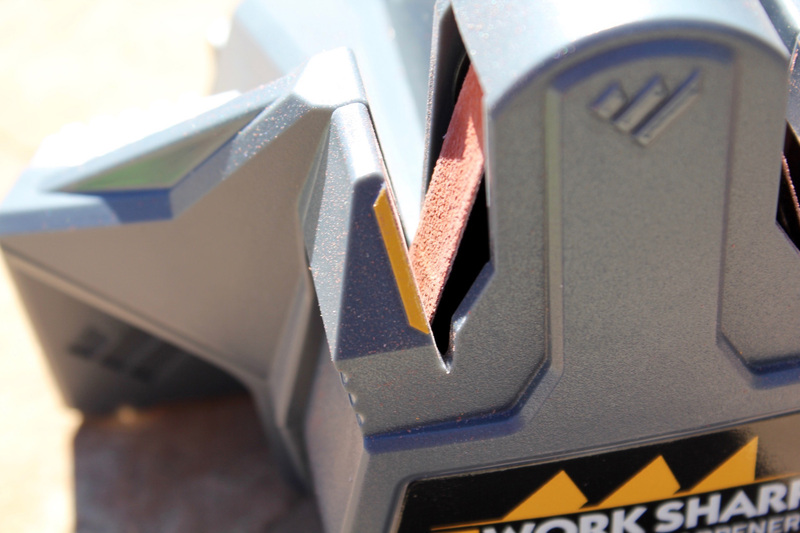 Sharpeners come in all shapes and sizes and perform vastly different functions. The endgame is always the same: to sharpen a knife. 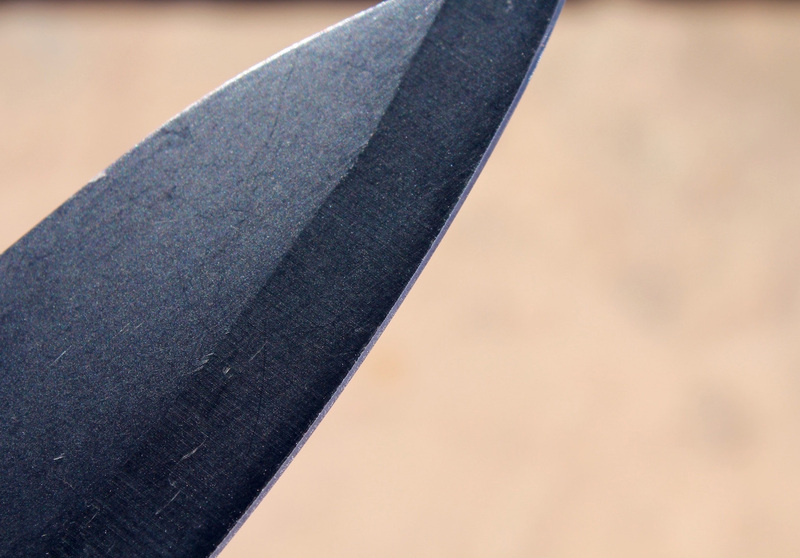 It’s a well-known fact that a dull knife is more dangerous than a sharp knife because it requires more effort and strength to cut. However, my main gripe with a dull knife is the simple fact that it’s less effective. 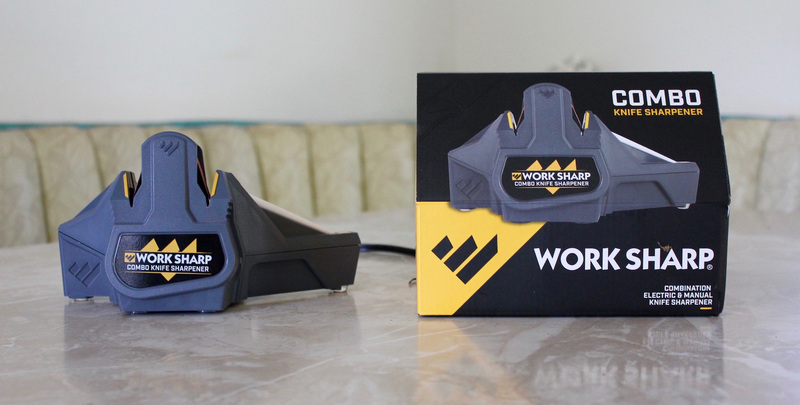 But if you’re the type of person who can’t be bothered to take out the old whetstone and honing oil or simply don’t have the skillset to do freehand sharpening, Work Sharp’s newest item called the Combo Knife Sharpener is made for you. Work Sharp sent me a unit to review, so I decided to answer whether this is the sharpener for you. Before we get into the review, it’s important to understand the target audience of the sharpener; otherwise, I wouldn’t be able to accurately give it a fair review for what it’s designed for. If you’re a hard-core knife user with high-end knives featuring complicated grinds and different edge angles, the WSCMB is not for you. But if you’re an amateur knife person who has never sharpened a knife and frequently use less expensive knives, this is your knife sharpener. 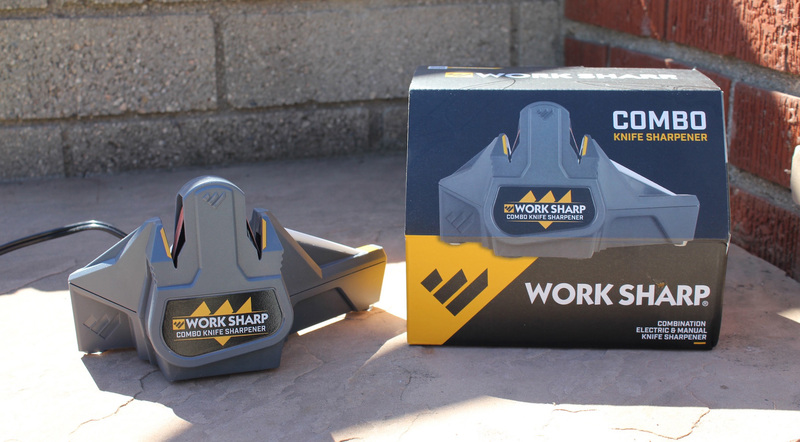 Work Sharp has three levels of power sharpeners. 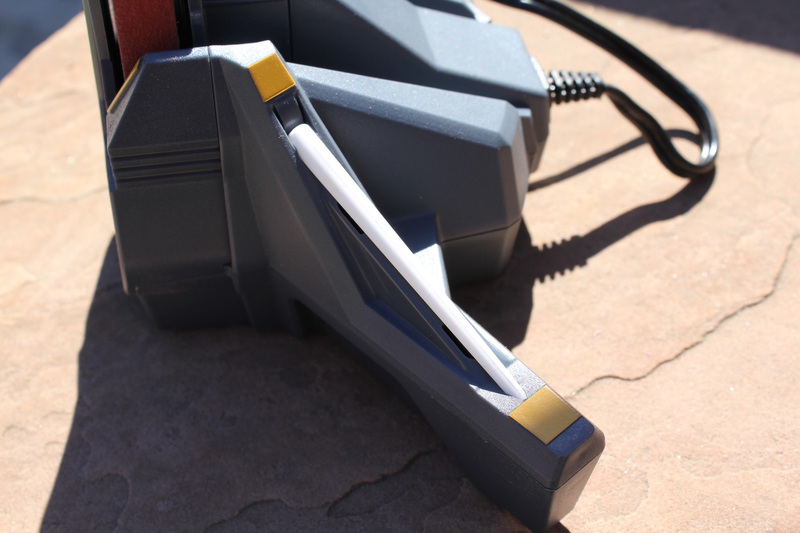 The Ken Onion Edition Knife & Tool Sharpener is the ultimate solution for your sharpening needs. 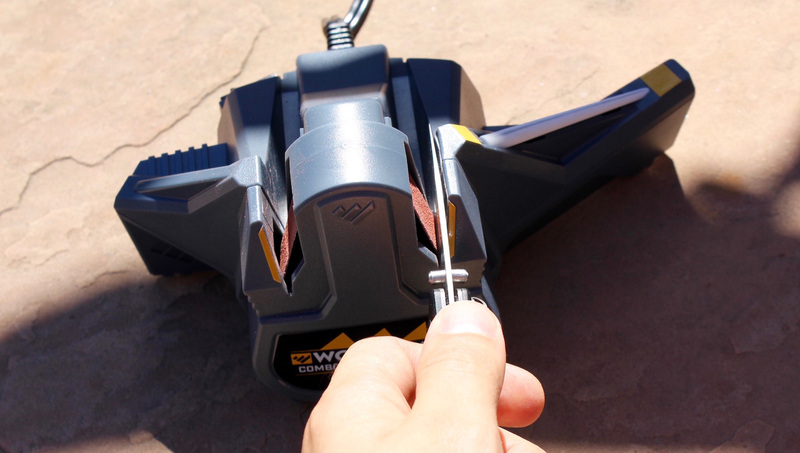 It can sharpen every knife (and edged tool) you own with adjustable angles and variable speeds. This is for hard-core knife enthusiasts. For those who don’t need as much customization but still want some control, the Original Knife & Tool Sharpener is still one of the best out there. The Combo Knife Sharpener is the simplest of the available power sharpeners from Work Sharp. The WSCMB sharpener has an insanely quick and easy setup. It comes in a compact box a little larger than the size of the machine (which is already as compact as it gets without sacrificing convenience). Included with the main unit inside the box is an additional abrasive sharpening belt, instructions, and a quick-start guide. That’s it. To set it up, you simply plug it into an outlet, and it’s ready to go. This is huge for the amateur knife sharpener without much experience sharpening knives. 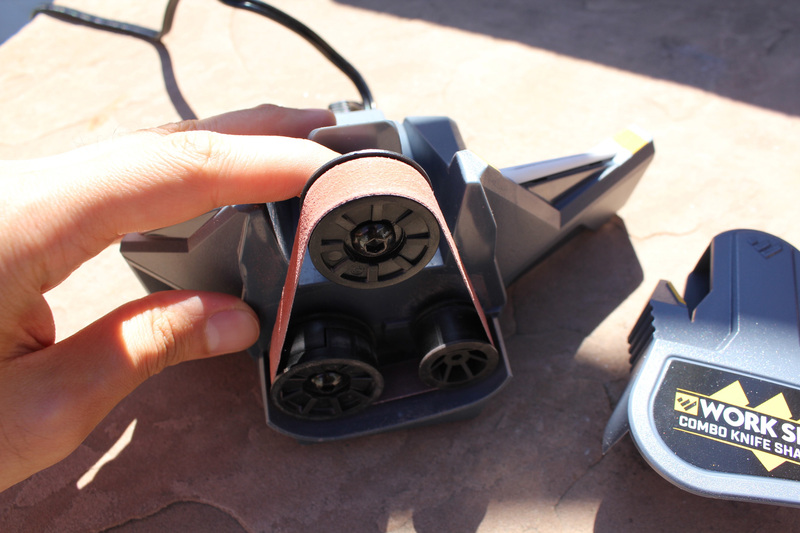 The device features a 120V single speed motor with a light duty cycle. I haven’t tested, but I heard it’s about 20 minutes. It uses a 1/2″ x 10″ P120 abrasive belt by 3M. Work Sharp has said one belt can sharpen knives up to 100 times before replacing, though I imagine mileage may vary depending on how dull the knives are. It’s called the Combo Knife Sharpener because attached to the machine is a tapered ceramic rod that allows for general honing and sharpening of serrations of different sizes. So you get a power sharpener and a manual honing tool all in one. The sharpener is surprisingly light, but it comes with five non-slip grips affixed to the bottom to prevent any accidental slippage. Needless to say, Work Sharp put a lot of thought and consideration into the overall design and functionality of the sharpener. That’s why it’s no surprise the device won the BLADE Show 2016 “Accessory of the Year” award. 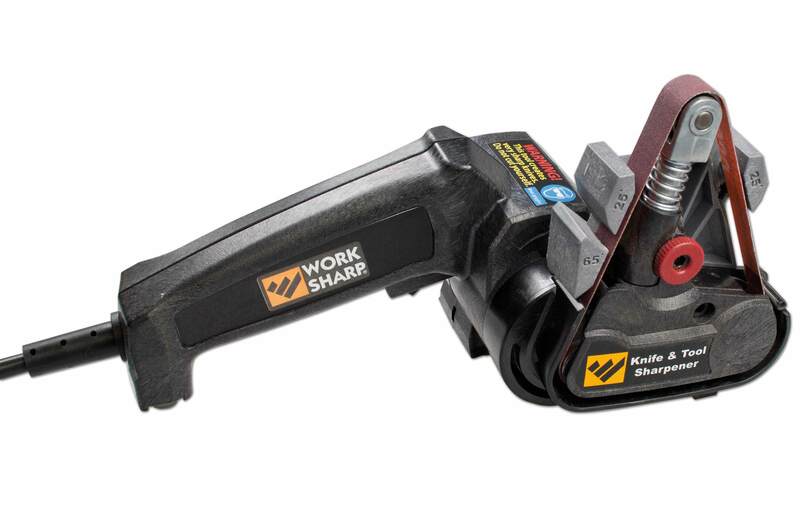 Now let’s answer the most important question: Just how well does the Work Sharp Combo Knife Sharpener perform? 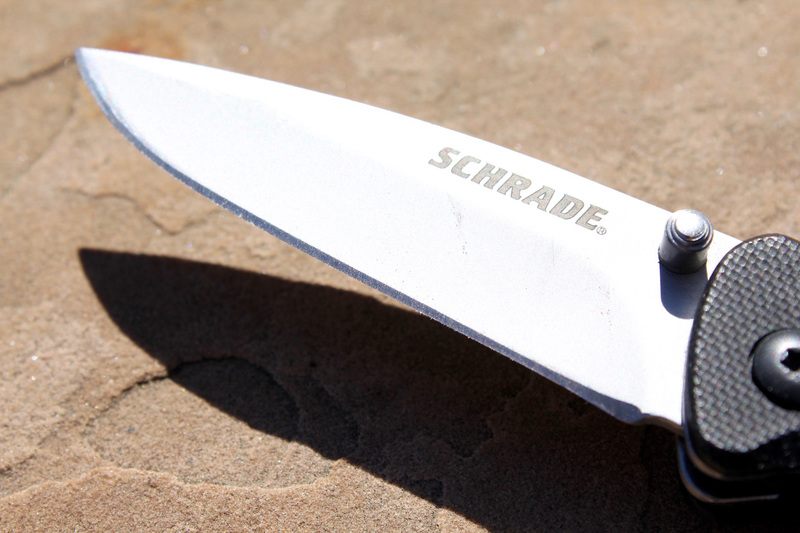 Since this sharpener isn’t really aimed at higher end knives, I thought I’d start off with one of my inexpensive beater knives: the Schrade SCH107. This is a cheap but hardworking little knife with a 2.5-inch blade made from 9Cr14MoV steel. You start off by turning the sharpener on via a switch in the back. This starts the belt on its rotation. Convenient amber guides adorn the slots where you pull the knife through. You simply rest the blade against the guide and let the weight of the knife provide the pressure. The general rule of thumb is to pull it back around 1 inch per second. So if you have a 4-inch knife, it should take 4 seconds to pull the knife through. I did the SCH107 in about 2 to 3 seconds. Work Sharp recommends 10 strokes on the belt (alternating 5 per side), but it will depend on the severity of a knife’s dullness. I did three strokes for each side with the SCH107 because it wasn’t extremely dull. You only sharpen until a burr develops. I didn’t encounter the issue, but people complain about Work Sharp sharpeners rounding the tip. This is a common issue with all electric sharpener and can be remedied by removing the knife before the tip gets to the end. Once a burr has developed, it’s time for the ceramic rod. The tapered rod also features convenient amber guides that tell you exactly the angle you should be pulling the knife across. Again, Work Sharp recommends 10 strokes on the rod (alternating 5 per side), but it may not take that many swipes. 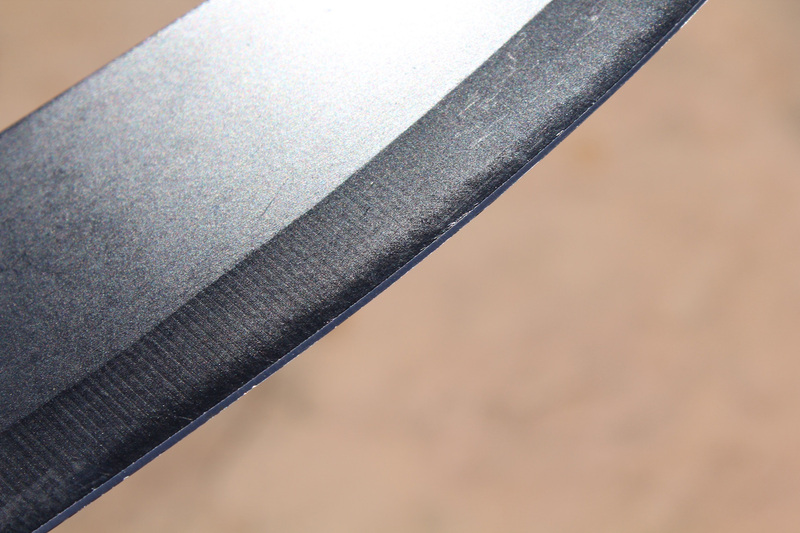 The tapered rod is a nice touch because it allows the sharpening of different sized serrations. After 8 strokes on the rod, the SCH107 was finished. It passed the magazine paper test and was arm-hair shaving sharp. The end result was superb. In less than five minutes, the knife was exceptionally sharp. I wanted to do a few additional tests before jumping to conclusions. The next knife I tried was a kitchen knife. I was curious about how it would handle a fixed blade and one that was a bit longer. I opted to sharpen a chef’s knife from Edge of Belgravia—a relatively new kitchen manufacturer in London. The stainless steel is a mystery (despite reaching out to the company a few times), so take it as you will. This is a knife that doesn’t get much care in the kitchen, which is why it wasn’t very sharp and had a few nicks in the edge. You can see a few of the nicks closer to the bottom, but it’s generally not in good shape. I wanted to see if the sharpener could reprofile the edge. The sharpener worked very well with the 6-inch blade. It can easily handle longer edged tool and edges with curves. As expected, after 10 swipes on the belt and 10 swipes on the ceramic rod, the knife was exceptionally sharp. And, as you can see, the nicks came out without a hitch. I also tried a $5 piece of junk I bought from a drugstore more than 15 years ago to see what it could do. The quality is so bad that I have no idea what kind of steel it is. The Combo Knife Sharpener took it from literally being unable to cut a piece of paper to smoothly and confidently slicing through it. This poorly designed knife has a large and oddly placed thumb stud that did interfere with the process. Large or misplaced thumb studs will make things harder, though I didn’t experience that with any of the higher end (as in more than $5) knives I own. For what it does, this sharpener has so far excelled at quick and effortless sharpening. There are some things to note, however. Unlike the other Work Sharp models, this has a fixed angle at 25 degrees. For most pocket knives, 25 degrees is a standard angle. Many kitchen knives are anywhere between 15 degrees and 20 degrees. That means if you have a higher quality kitchen knife (or a knife with a different angle), you may want to avoid using this sharpener. It’s one of the reasons I don’t want to try it on my Victorinox Fibrox 8-inch Chef’s Knife. This sharpener also creates a convex grind. So, again, if you have a knife with a scandi grind, don’t use this sharpener. If you have a different kind of grind and don’t mind reprofiling the blade with a convex grind, then go for it. The machine’s focus on simplicity extends to maintenance. Replacing the belt is easy. Just pull up on the center section to remove the sharpening guide area. Then push down on the belt tensioner and it’s off. Cleaning it is similar. It requires a small brush to get the debris clear. You can even use an eraser to get shavings off the ceramic honing rod. I’ve said this a few times already: this is not a sharpener for hard-core knife collectors. 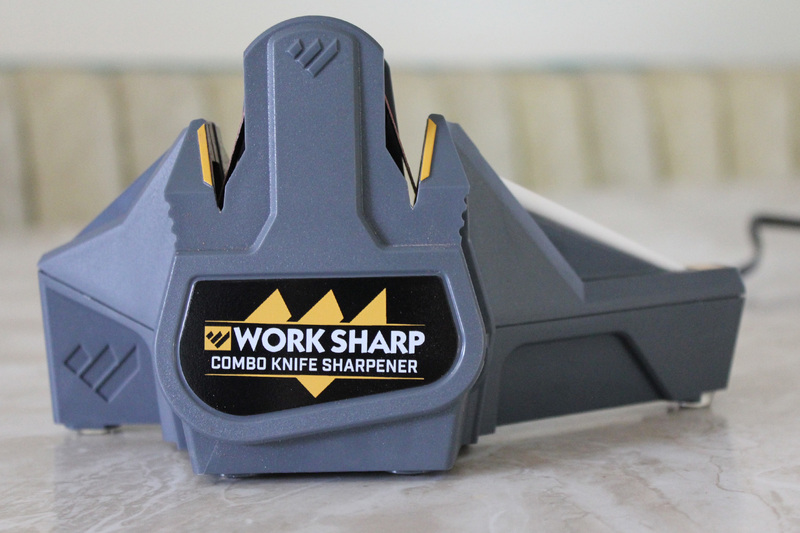 But if you’re looking for a quick way to get some of your mid-tier knives sharp without much effort, the Work Sharp Combo Knife Sharpener is the ultimate tool. It has so many things going in its favor. It’s simple, clear, lightweight, and just works. You can’t change the angle or the speed or create complex grinds, but that’s not what this is designed for. If you want those features, opt for the Ken Onion Work Sharp or Original Work Sharp Sharpener. This is something an amateur could happily fit on a workbench to touch up knives when necessary. Overall, I highly recommend this sharpener to all the amateurs out there without much experience sharpening. This would make a great gift for dads who use knives casually or folks who just want to touch up some kitchen knives. With an MSRP of $59.95 and a street price at about $50, this is a great introductory sharpener. Check out the Work Sharp website for more details.